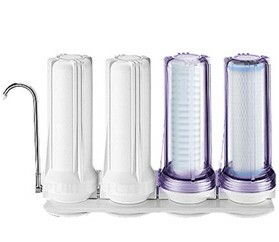 As I suspect most folks investigating this system have done, I extensively researched potential water filtration system options before landing on this one. This thing is so sweet. I considered going without the UV light, but I am so glad I said screw it and went full bore. The physical setup of this thing alone makes me feel like Walter White in the lab :) Setup was straight forward (including the flow meter which I installed at the same time), and it is very comforting to know that with a simple kit (offered on this website) I can convert to an undercounter setup whenever I eventually move into a house. The taste is excellent. I am very pleased to have safe, great-tasting, not-stripped-of-minerals-and-good-stuff-that-RO-removes water on demand and without having to take a trip to a natural spring or anything like that. One tip on the install: because of my faucet's recessed aerator thread region, I actually had to get a diverter adapter from Home Depot that is slightly longer than the one that comes with this kit (I'm talking like only 1 thread pitch longer) and use a Dremel to bevel the top edges of the aerator thread region on the faucet. Before doing that, there was no way to tighten the adapter sufficiently. After the beveling, I could tighten the adapter easily to ensure zero leaks. The adapter was only a few bucks, and the beveling was free of course. In any case, just a tip for those who may encounter a similar situation. Not a big deal at all. We were so pleased with our purchase and our dealings with this company. We had a lot of questions, and all were answered personally by the owner. The service was excellent, and we even got a discount on the price.